"Brothers & Sisters" star Luke MacFarlane has come out of the closet today and announced he will become series regular on the ABC series next season as his character Scotty Wandell marries his boyfriend Kevin Walker (Matthew Rhys) as part of an upcoming May sweeps storyline. In an interview with Globe and Mail, Canadian MacFarlane, who has appeared on the ABC family drama since its beginning in the fall 2006 in a recurring role, says he is looking forward to being series regular on one of the first shows on network television to portray a gay marriage between two main characters. In the article, MacFarlane went further revealing that he too wishes to marry one day and that, despite some concerns over his professional future, he made a decision to go public with his own sexual orientation. MacFarlane however declined to reveal whether he is currently involved in a relationship. Whoever the man of Luke's heart is (if there indeed is one at the moment), he has made me very proud to be a Luke MacFarlane fan today and I wish him the very best in his personal life as well as continuing success in his career. 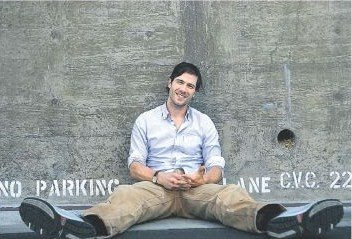 Read the full Globe and Mail article about Luke MacFarlane coming out. You didn't read my email in time!!! I hope you read my email about it since I sent it to you at 3AM PST my time today. Awwww that's like the BEST news ever!!! I heart Luke!!! Actually I received several emails asking me to post the story, so a big thank you to all of you guys - including my regular readers KC and Gio.